Recently, XJTU Jia-Lab for Interface and Atomic Structure summarized progress of recent years in fabricating freestanding single-crystalline functional oxide films via epitaxial lift-off technique. Freestanding single-crystalline functional oxide films show high mechanical flexibility by removing the physical limits of conventional oxide substrates. Meanwhile, they are compatible with semi-conductor technology as are other 2D materials, enabling their applications in flexible memorizers, flexible energy-harvesting devices and semiconductor field effect transistors. 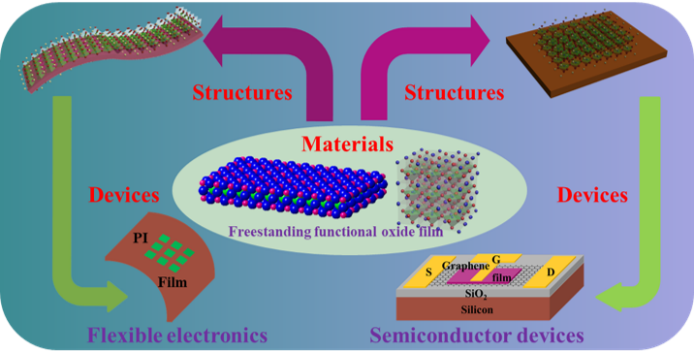 The research result was published in a well-known journal, Materials Horizons (IF=13.18), under the title “Recent progress on flexible inorganic single-crystalline functional oxide films for advanced electronics”. XJTU associate professor Liu Ming from the School of Microelectronics is the only corresponding author. Doctoral candidate Zhang Yong is the first author. XJTU associate professor Ma Chunrui from the School of Materials Science and Engineering and professor Lu Xiaoli from the School of Microelectronics also participated in this project. The research project was supported by the National Natural Science Foundation of China Major Program and General Program, the National Basic Research Program of China (973 Program), the China Postdoctoral Science Foundation and theFundamental Research Funds for the Central Universities.